Over a period of only a few years, my parents both died of cancer, I had four miscarriages, my husband and I divorced after seven years of marriage, and my dog, Lita, of sixteen years, died too. It was intensely difficult and I fell apart, closing the blinds and holing up in my home for months, suffering from anxiety and depression. I hardly recognized myself. At the same time, even in my darkest hours, I knew in my heart I would somehow get through. In the midst of these mid-life crises, wondering when I would get over the debilitating, soul-crushing loss, I drew upon the creativity principles and practices I had learned and taught for over twenty years to connect to something greater and overcome. A few months after all of the losses, I made a new friend whose father had recently passed away. I invited him over for a bowl of my famous Italian chicken sausage lentil soup at my home in Los Angeles. I know. I was speaking for myself. At any given time, without knowing how, or why, grief can overcome us in a number of ways. We can get super pissed off. Or want to hide. Or push away those we love and wall off. We can try to numb the pain. Suppress feelings. Seemingly insignificant events might trigger us. A memory or random happenstance might well us up. We all mourn differently, wanting more than anything for it all to end. And sometimes pretend that it’s over when it was not. I was told once that there was grief and frozen grief. Frozen grief can stop both personal growth and future healthy bonding. For some people, depression and emptiness can become so debilitating they get stuck in the grieving process and have trouble letting go, a process that is akin to water passing from a solid state to a liquid, a cohesion of molecules holding together and resisting separation. Warmth and equilibrium are what’s needed to heal. But there’s not a single temperature that can be considered to be the melting point of water. In 2004, I received my Masters in counseling psychology in Los Angeles at the same time I met my husband Shlomi. I was thirty-four. He was thirty-two. I worked as an intern in a clinic, counseling individuals, couples, families, and youth groups. It felt good to be of service but I was passionate about the creative process and the creativity principles I’d studied as an actress, writer, and painter. Soon after, I opened up a private practice working mostly with creatives in the entertainment business. My goal then became: To help everyone, not just creatives, become the artists of their own lives. Ultimately, I believe everything we do is creative. The way we think. The way we problem solve. The way we make the most of our lives. How we become stronger, healthier, more alive and free is creative. How we start, continue and complete a successful project and manifest our dreams is creative. How we parent, work, and handle our relationships is creative. Whenever we look for how we can resolve a situation creatively, we empower ourselves. After the death of my parents and dog, facing my infertility, and my divorce, I closed my practice in order to focus on my own healing. Two years after that, I was stronger for sure, but I still felt utterly lost and purposeless. I didn’t want to return to counseling but wasn’t sure what I would do next. I worried then I was frozen, stuck in a frozen state of grief. I desperately wanted to move on, for my new life to begin, one of happiness and success. But creating deep lasting inner change was going to take time. As much as I wanted to be over my pain, I couldn’t force it to go away. I was going to have to access those deep places inside of myself to update them to a new way of being. But getting in touch with your better self doesn’t always happen overnight. For me, it ended up taking four years. To truly make profound lasting change, it takes determination, practice and sometimes, outside help. My work during that time was to learn how to have a deep, intimate relationship with self-love. To let go, accept and heal, I had to meet myself exactly where I was and face my darkness. Slowly, step-by-step, I faced my disquiet and uneasiness and then, came to the realization that I had become so accustomed to my new life, I was shocked to realize I had created an even better life for myself than I could ever imagine. In the grand scheme of things, I can look back now and see all that I learned and how much I grew. In allowing myself to be broken, I became whole. It was quite miraculous, really. In my most broken hideous moments, the most magical thing happened. I came to love my big beautiful messy self. I came to accept her like nothing else. I missed my mother and father, the husband I loved, the babies I didn’t have and the dog that had replaced them, only for me to lose her too. But I came to care for myself like my own parent, my own spouse, and my own child. I was all I had left. And if that was it, then I was going to love her. Loving myself meant allowing myself to be as messed up as I was; to not apologize a hundred times for every one of my mistakes, or kill myself over them; to humbly say to others and myself, This is it. And then, as I tried to take a kinder approach to myself, I began to accept and love others like myself. They got to be messes too. And my heart opened. And I found boundless joy and happiness. Nothing’s harder or more painful than having to face loss and adversity. We can experience many confusing stages that make us question everything. Negative emotions can take over and cripple us when our relationships bring challenges, or we endure the loss of health, a home, job, or loved one, or when we wish for just once that when things started to get good, they would stay that way. Yet tough times are really offerings to show us what no longer serves us. Once they’ve passed, they no longer have power over us. No one, including myself, wants to feel pain. When suffering from depression, I became accustomed to the lethargic haze, heavy-laden legs, and foggy head that made other people’s words waft way above me. My heart used to pound from anxiety that sometimes made me feel so vulnerable I feared leaving home. The day I overcame that anxiety, was when I finally stopped trying to force myself to be different than I was. I came to the realization that there was no problem with me and being human truly was enough. These are some questions that helped me that I hope help you. There was nothing you had to do, change, or fix? You didn’t have to be different than you are? You could love and accept your big beautiful self? I was taught while getting my counseling psychology degree with an emphasis on spirituality, We’re all spiritual beings having a human experience. For decades, I focused on the spiritual part, but what about just being human? We want to believe a life-changing transformation will come upon us, and one day like magic, we’ll wake up and all of our issues will have vanished. Without the pressure, grasping and need to fill what I thought I was lacking, I could feel at home with myself and find peace. I could have more acceptance and compassion for what arose in me. And rather than fix it, try to change it, I allowed it to be present. I didn’t have to do anything. I was free. Could you still better yourself without any pressure? Focus not only on accomplishing, but just being and learning? Be more than okay just the way you are in all your messy glory? 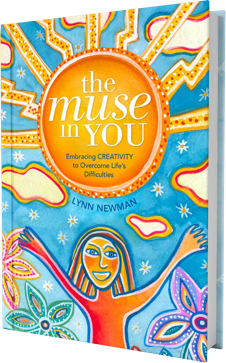 The purpose of this book, with its stories, worksheets, quick exercises, meditations, and the inspired questions it asks offer you the support you need during the tough times. We can sometimes forget the awake, creative, beings we truly are. This is a loving reminder. How do we transcend our circumstances to find lasting peace and happiness? How do we unlock the chains of the mind and become free again? How do we exist in joy, certainty, and radiance? How do we invite more adventure into our lives, free our passions, start and complete projects, or simply have less stress and more ease? How do we discover our life purposes and move quickly towards our desired destination? How do we have a deeply intimate, loving, healthy, relationship? How do we create more of what we want to reach our dreams? There are answers to these questions and they might not be what you think they’d be. It’s not the answers we’re striving to seek. It’s the questions. You’ll see. Ready to be the muse?